The compilation which features 14 remixes, either by or for Diesler, combines styles ranging from hip hop, afro and jazz to broken beat and funk. Also don't miss the exclusive reggae remix by Grant Phabao available here! Burnley based producer, DJ & band leader Jonathan Radford, aka Diesler, returns with his first release since 'The Rhythm Station' LP last year in the shape of remix compilation 'Tracks On The Rocks'. The compilation which features 14 remixes, either by or for Diesler, combines styles ranging from hip hop, afro and jazz to broken beat and funk. Featured artists include The Cuban Brothers (Sunday Best), The New Mastersounds (One Note/Record Kicks), Kid Kanevil (First Word) and many more. Amongst many treats on the collection is 'Revelations' remixed by The Jazz Invaders. The once bouncy disco original is transformed into a sublime dance floor classic, dripping with the trademark contemporary sound of dance floor jazz that the Invaders are known for. Up tempo party favourite 'Here We Go' by American producer Ruckus Roboticus is given the Diesler treatment on this compilation, taken from the championed debut LP 'Playing With The Scratches' on Grease Records. 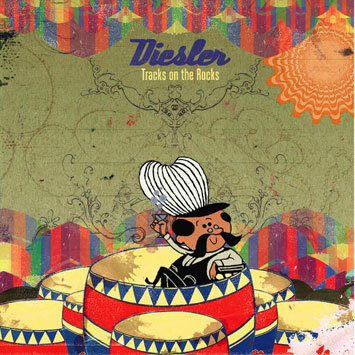 'Tracks On The Rocks' displays some of Diesler's most prolific and diverse remixes onto one complete body of work, his forth CD in 4 years. From solo sets behind decks to teaming up with supreme vocalist Laura Vane and Katie Miller, Diesler has proved that there is no end to his talents. wohoo, yes! love the kokolo remix... great album.